There seems to be a mini-industry growing up in making recordings of large-scale orchestral works in cut-down versions for chamber forces or piano. I am thinking of the extensive Brahms four-hand piano series on Naxos, Shostakovich�s Fourth Symphony for two pianos and, very recently reviewed on MusicWeb, Mahler�s Fourth and Bruckner�s Seventh Symphony for chamber orchestra (see links to reviews below). 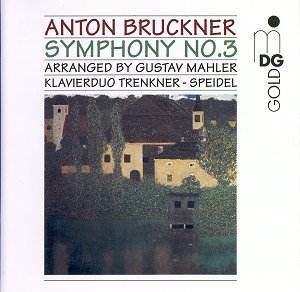 Here is Bruckner�s Third Symphony for piano duet in a version mostly created by a youthful Mahler. There seems to be some debate about who did exactly what but the simplistic solution seems to be that Mahler transcribed the first three movements and Krzyzanowski (who?) the last. As far I can judge from Nowak�s 1877 orchestral score, the middle movements are barely altered although the debatable coda of the scherzo is omitted. The last movement contains some cuts towards the end, perhaps foreshadowing the later 1889 revision of the work. In the first movement it seems as though Mahler occasionally used his creative powers but essentially this sounds like Bruckner throughout. The recording dates from the mid-1990s and it seems still to be the only version on disc. Despite generally positive previous experiences, I still approach �cut-downs� with some sense of disbelief. There are inevitable losses since it is impossible to recreate the levels of contrast which the orchestra brings. In particular, the brass is most missed and not only in the famous trumpet solo near the opening. But, as previously, I did find gains in clarity and Bruckner�s vision does not merely survive in this performance � it burns brightly. Speidel and Trenkner are an impressive duo, combining great technical skill and functioning as one. Most of all, they recreate the music in an interesting and valid way. Some of their tempi are daringly slow in the first two movements � more than 22 and 17 minutes respectively puts them amongst the slowest on record for the 1877 version. This was contrary to my prior expectations but nevertheless mostly convincing, especially in the slow movement. For an example of how good this is, listen to the feeling of mystery the pianists manage to create at the letter C in the second movement. In the last two movements speeds are generally quicker than the norm. The scherzo in particular fizzes along and sounds quite spectacular � making this a �must hear� for any Brucknerian. In finale, the striking section juxtaposing polka and chorale comes off surprisingly well. The very end of the work is never quite going to pack enough punch on the piano but Speidel and Trenkner give it their best shot and the finale as a whole is impressive. The recorded sound is perfectly acceptable and there are reasonable notes. More information on the creation of this edition and Krzyzanowski rather than the (well-known and chequered) history of the work would have been welcome.